These are SOME of the headstones of the North Road Cemetery. In an attempt to save as much space as possible and increase the speed of downloading, only part of the stone is displayed. Flinders Ranges Research has a full photograph of each of these, and many others as well. 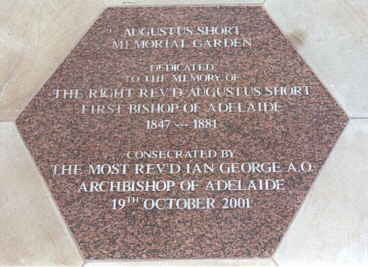 North Road cemetery was established by Bishop Augustus Short in 1853. Its original size was two acres but has since grown to eighteen acres. More than 24,000 people have been buried during the last 150 years. Augustus Short (1802-1883) arrived with his family in South Australia in December 1847. 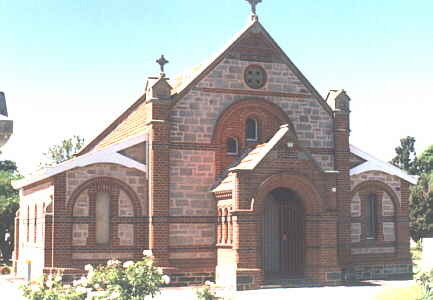 Began building of the Anglican Cathedral in 1869, founder and first vice-chancellor of the University of Adelaide in 1874 and founder of the Theological College in 1880. He resigned as bishop in 1881 and returned to England where he died in 1883. 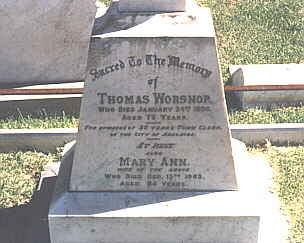 Thomas Worsnop, aged 76 died 24 January 1898. Town Clerk of the City of Adelaide for more than thirty years. His wife, Mary Ann, aged 84 died on 15 December 1905. Born in Leeds, Worsnop was educated at the University of Cambridge and started teaching at Port Elliot before becoming a publican, farmer, outback carter and finally in 1866 Town Clerk. 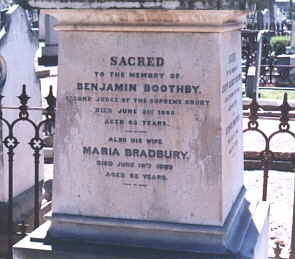 Benjamin Boothby, second Judge of the Supreme Court died 21 June 1868 aged 65 years. His wife Maria Bradbury died 18 June 1889 aged 82 years. Born in 1803, Boothby was appointed second judge in 1853 but dismissed for 'misbehaviour' in 1867. 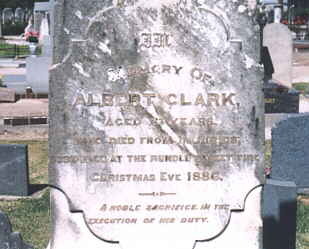 In memory of Albert Clark, aged 23 years, who died from injuries sustained at the Rundle Street fire on Christmas Eve 1886. A noble sacrifice in the execution of his duty. 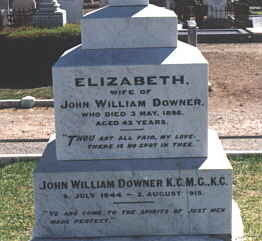 Elizabeth, wife of John William Downer, who died 3 May 1896 aged 43 years. Sir John William Downer, KCMG, KC. Born 6 July 1844 died 2 August 1915. Educated at St Peter's College, Downer became a lawyer and QC in 1878. He also entered South Australian politics in that year and became a member of the House of Assembly until he entered federal politics. However in 1905 he returned to South Australian politics after missing out on a seat on the first High Court.